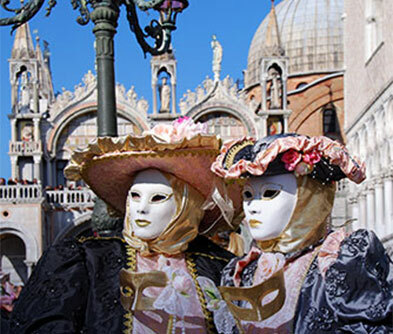 Beautiful Venice dresses up in masks and costumes in the countdown to Lent. In the biting February cold, when everything is grey, 15 days of colour and gaiety paint the town red. And blue. And possibly all shades to lift the veil off winter. 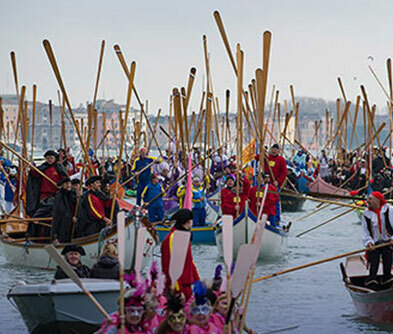 The general idea behind the Carnevale is to party like there’s no tomorrow for a couple of weeks until Shrove Tuesday – the day before Lent. This is the Carnevale. And it is one of those times when natives actually give you the stares for being comfortable in your own skin. You might want to slap across a mask on your normal attire. Just to feel one with the spirit of the festival. Piazza San Marco is the place to be, especially during the concluding weekend of Carnevale. 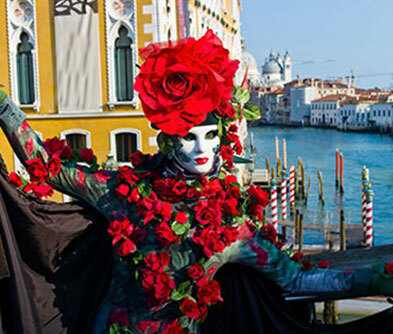 It is here that ‘Maschera Piu Bella’ or the most beautiful mask competition is held. Sip on utterly delicious hot chocolate at San Marco or indulge in Venice’s sea food and Venetian Tapas – Cicchetti. Parakeets, witches, masquerades of King Louis XVI, Marie Antoinette, hedgehogs and panthers go by, offering a somewhat surreal visual treat. Amidst the din and festivities of the carnival, steal a quiet moment to gaze from behind your own mask and wonder at the disguises that humanity sports!